Yesterday I had the opportunity to share a message with our local Mothers of Preschoolers (MOPS) group. When my friend, Sharon, invited me to speak, I quickly chose Galatians 5:13-25 about the fruit of the Spirit and wanted to share with the women about becoming "fruit-filled moms." A few weeks ago I checked in on their webpage to learn a little more about the group before starting to prepare. 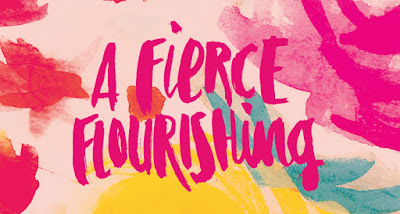 There I learned that the theme for the year is A Fierce Flourishing. What a great image, right? I loved how simply reading that phrase made me want to rise to the occasion of mothering my children, to fight for goodness in our home, and to see God make us thrive! Because God is good and guides, the Galatians passage fit so well with their theme. In this post I will give you the condensed version of what I shared with the ladies yesterday. In short, we can only experience a fierce flourishing with God. It begins by putting our faith in Christ - i.e. becoming a Christian - and continues by living life by the Spirit. Never, at any moment, can we go it alone! The ladies and I started our time together talking about how being a mom was different than we expected, in both positive and startling ways. We enjoyed some laughs and agreed together about the joys and challenges. Then we made up a little list of what a "good mom" is, acknowleding that none of us are living up to that standard that we're always trying to attain. What I wanted to encourage the women with at this point was that God can transform us into that kind of mom: loving, attentive, patient, making wise choices for her children, etc. We are all so painfully aware of our inadequacies, but God can enable us to experience a fierce flourishing as we walk with Him! It starts with believing the good news. So before I could get to reading or talking about life in the Spirit from Galatians 5, we had to talk Good News. I laid out the story of how God created things to be, how sin entered the world, how Scripture tells us our biggest problem is spiritual, and how God, because He loves us, made the way back to right relationship with Him through the death and resurrection of Christ. (I know you've heard me talk about this now and then here on the blog!) Of course, for the Good News to make any difference in our lives, we have to respond to the message by faith: admitting we are a sinner in need of saving (repenting) and believing Jesus is the Savior and Lord. After sharing that, I wanted to be clear with them what happens when we put our faith in Christ - several incredible things! Our sin is removed as far as the east is from the west. Guilt and shame and forgiven, we can approach God freely with confidence, not fear. Christ gives us His righteousness. God looks at us and sees His perfection. We are filled with the Holy Spirit. God empowers us to live for Him! We have the promise of eternal life with God. All things will be made new. That's so much more than a ticket out of hell, isn't it? Such Good News! Good News of new life! As I had been preparing for the talk, reading through Galatians 5:13-25, it hit me that becoming a "good mom" is a spiritual issue. We can try out cool ideas and establish good routines as mom, and those are helpful. But they are secondary to our need for a change or heart, a transformation of character that only God can bring about inside us.